Greenfield Villa. A 3 bedroom villa on this newly completed western built development. The house comes fully furnished, plus includes a fully fitted European kitchen, fitted bedroom units with master bedroom having a large walk-in wardrobe, and completed bathrooms all with hot water. The development has 24 hour security, wide landscaped roads and a gymnasium. 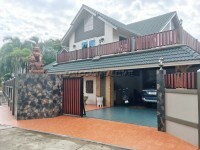 The house is held under a Thai name. 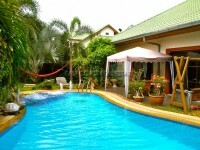 Owner will also consider renting their property for a minimum period of 1 year contract 55,000 Baht. These rental figures INCLUDE swimming pool, and garden maintenance.